1 of 4 In a ziplock bag, combine orange juice, marmalade, garlic, soy sauce, brown sugar, vinegar, sesame oil and chili paste. Add pork chops, seal bag and marinate in refrigerator 60 minutes. 2 of 4 Heat a stovetop grill pan to mediumhigh or broiler to high. Remove chops from plastic bag, reserving marinade. Grill or broil chops 2 minutes per side or until internal temperature reaches 145 degrees . Place marinade in a small saucepan and boil 5 minutes. 3 of 4 Meanwhile, bring a large pot of lightly salted water to a boil. Add snap peas and cook 1 minute. Stir in angel hair and cook 2 minutes. Drain. Place in a bowl, toss with 2/3 cup of the reserved marinade and sprinkle with sesame seeds. 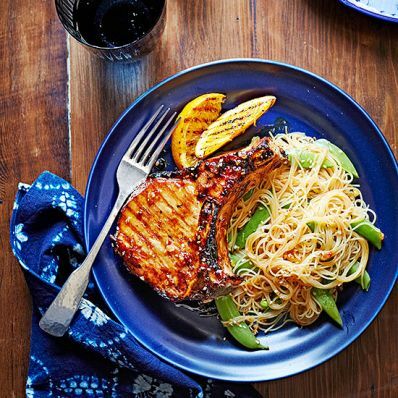 4 of 4 Serve pork chops with noodles, snap peas and remaining marinade.